When we asked our network for some tips for the marathon, we had no idea how many great tips we’d receive. Below you’ll find a compilation of tips for before, during, and after your training and great ideas for the day itself, drawn from personal trainers, running clubs, osteopath, us (of course! ), nutritional therapist and mindfulness coach. Because there are so many, we’ve included an index at the top, so click to your preferred section or skim through. Staying Motivated Organised Training Runs Don’t Run Through Problems! Medical check-up: Even if you’ve already been running, check with your doctor and let him or her know your plans to train for and run a marathon. Running Gear: While you don’t need to buy lots of expensive gear, the right running shoes are an important investment. Getting running shoes that are suitable for your running style, foot type, and level of experience will help you run comfortably and injury-free. Running clothes designed to breathe and wick away sweat will help keep you dry and comfortable, and a well-fitting sports bra is a must for women. 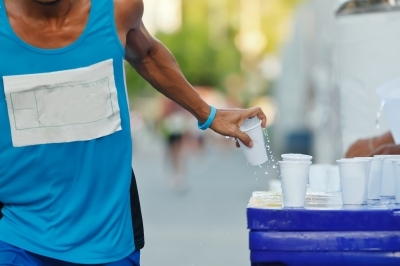 You’ll also need a good water bottle or hydration belt to hydrate during runs. We also suggest an MOT sports massage to check where you’re carrying tensions or imbalances – certain tension can indicate overuse of one leg, or instability/postural imbalance that over the long run could decrease your efficiency. Plan to build up steadily, i.e. no more than 10% per week. Do one long run 3 weeks of every 4. For these runs, duration is more important than speed and you need to build up to training runs that last slightly longer than you expect to take on the big day. Vary your runs and use them to explore. Run with a group as much as possible, especially the long weekend run. No drinking – it affects your body for a few days, and avoid overeating (e.g. large Sunday lunch). Keep your partner happy and with their help you will train a lot happier. Take special care of the feet and toes (cut nails, take off hard skin) for they will be subject to hours of training. Above all enjoy your running, get up in the forest all around Wanstead Flats up past Whipps Cross. Personal trainer Ryan Robinson suggests including a high intensity interval training session once per week. Frank Brownlie, chairman of East London Runners, suggests participating in organised training runs a few times prior to the marathon, of varying distances from 13 to 20/22 miles. This will get you used to getting out of bed early to get ready, about two hours before you leave home, helping you work out your routine for the toilet, eating, hydration, etc, and preparing your running stuff. It will also help you work out your routine for the morning pre-race, eating, hydration, etc. Doing this will stand you in great stead for Marathon morning itself. ‘Tune in to how you feel during training. Be particularly aware as you increase mileage or on longer weekend training runs of any muscle tightening in hamstring, calves or glutes, or of tenderness in or around the knee, hip and ankle. Make sure you do regular stretching and some minor problems can benefit from self-massage. These precautions should prevent chronic injuries developing and reduce the chance of missing the big day. Having a regularly-scheduled massage while you’re training for the marathon can help keep an eye on muscle tension or any imbalances that may be developing and allow you alter your training/conditioning accordingly. Many people opt for a fortnightly or monthly massage built in to their training schedule to make sure they’re getting the most out of their recovery time. Sports massage after intensive exercise has been shown to improve rate of recovery in muscles and reduce muscle soreness. Scheduling a massage within 24 hours of your long training run will help you get the most benefit. As you’re tapering off your runs, panic can set in in the last 10-14 days– did you do enough? What should you be doing now? Thinking about a massage? If you haven’t had massage during your training, we generally don’t recommend your first massage this close to the race – it may change your biomechanics in ways that you don’t have time to adapt to. However, you can have a pre-event massage, a quick, general flush of the muscles that doesn’t work too deeply but may help you feel energised. Pre-event massages for full body are usually about 30 minutes long. Make sure you’re wearing kit you’ve worn many times before. Vaseline and tape can help with chafing. Know where your supporters are meant to be ahead of time – making them simple flags with bright material tied to a garden cane will make them easier to spot. Agreeing mile number and which side of the road will help you look out for them. Letting them know about when you think you’ll be passing them will help them know when to look out for you. Don’t have anyone coming to the race, or found out last minute your supporters can’t make it? Co-opt other people’s. Everyone is so supportive at the London marathon they’ll cheer you as you go past. Sarah also suggests breaking down the distance mentally – the first 10 miles is your warm-up, then the run – when you have 6.2 miles left, you’re just out for a 10K – the last 5 miles is a short run, 3 miles you’re just doing a 5K. Breaking the distance down makes it seem less daunting. 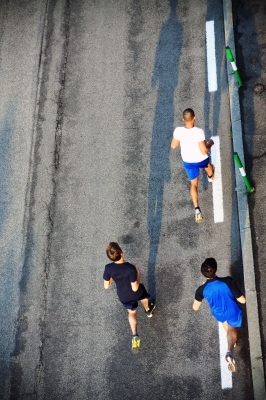 ‘As you are pounding the pavement in training or during the marathon itself, you can stay more focused on your present moment experience by bringing your attention to specific parts of your body in turn…start with noticing how it feels when your feet touch the ground, how it feels in the sole of the foot to land, peel off, lift, move and place your foot again. Notice the points of pressure shifting from one part of the foot to another. When you notice that your mind has wandered off (day dreaming, planning, rehashing conversations, whatever), as best you can, bring your attention back to the physical sessions, in your feet. Or perhaps moving your attention to your legs (or particular part of the leg), and after a while, moving your attention again to another part, perhaps your back, shoulders, arms, face…what physical sensations do you notice as you bring your attention and awareness to the different parts of the body in turn? To finish, widen your attention to the whole body, noticing what sensations are there moment by moment as you run. Having brought awareness to your body, you can expand your awareness to sounds arriving at your ears… your breathing, and sounds of your steps contacting the pavement or track, and other sounds around you. We hope these tips will help you prepare for the big day. If you’d like contact details for any of the professionals who provided quotes, we have included links to their website where applicable, or you can get in touch with us for their contact details.